Noel Lawrence was bass player with the Shades. Hi, I am a new visitor to your site and live in London, Canada. I was the bass player in the band 'Johhny Mike and the Shades' which you show on January 25th 1964 doing a show with the Stones. We played several times with them both before they became famous and after if my memory serves me right and also did some TV shows together as part of the bill. We toured with major stars such as Roy Orbison, The Everly Brothers and did shows with every one from Dusty Springfield to The Who. I have lost track of all the members of the J, M and the Shades except for the guitarist Dave Sumner who eventually joined Mal Ryder and the Primitives (after I had left the Shades), and moved to Italy where he played for Cameleonti for several years and still plays in various bands, even at the age of 60+. I cannot find any trace of our band's performances anywhere and so I was very excited to see the name crop up on your site. We were regular BBC Saturday Club performers and were only kept from being a major hit by a poor record company deal with Decca. This was orchestrated by our manager, Jack Fallon who owned the CANA Variety Agency on Wardour Street in London. If any one can tell me where to find info on the band I would be eternally grateful. ps. the Band was from Bath in Somerset but moved to London when we became full professionals. Brrrr! And what a way to start off our first newsletter. It was so cold at the beginning of January that our rhythm guitarist ‘Drive’ Ranse had to have de-icers fitted to his eyelids. Dec. 31st. found us at Northampton and the next day, New Years day, we had to battle, with the help of a borrowed shovel, our way to Swindon. In places the snow was up to the ‘Shadesmobiles’ window but somehow we managed to arrive on time. After Swindon we raced to London for a most important appointment, the first rehearsal for our very first television booking. Saturday Jan. 5th. we had our first breakdown. We finally restarted and nursed our ‘sick’ vehicle all the way to Peterborough from London, and we weren’t all that late either! Here was born a Shades motto, namely “The Shades always get through”. Calling at Mansfield on Sunday we were very much keyed up for Monday's rehearsal for the BBC’s 6.25 show. On Tuesday, the great day, we rehearsed all day, right up to the show. A temporary setback was encountered when ‘Charge’ Burns managed to get held up by a swing bridge in the centre of Bristol, thus arriving 30 minutes late for the afternoon session, but fortunately the producer ( an absolute tyrant by the name of Albert Stephenson – added note from Noel), was very understanding and we all breathed again. Sun. 13th. Jan found us groping through dense fog in Liverpool. It took us 2 hours to travel 5 miles. Actually we rather enjoyed our brief stay in ‘Beatle’ country but on our way back to London our van suffered a further ailment. This time the battery became overcharged and nearly gassed us all to death just outside Stafford. This happened at 1 o’clock. By 7 o’clock we were ready to move off again. By 10 o’clock everybody was suffering from a severe throat and stomach infection known as ‘lack of cup of tea ititis’. It was therefore decided to call on Noel Burns' unsuspecting parents for the antidote, which was hastily supplied much to the satisfaction of all concerned. Leaving Noel’s home (now tealess), which is just outside Birmingham, a trouble free cruise was envisaged. This was not to be however because to make our day complete we sustained a puncture and when we finally collapsed into the beds of our London Hotel we terminated a journey that had taken 16 hours to complete. The following weekend we were due back in Birmingham but in the meantime we discovered that one of our members, Mike Wayne, who shall remain nameless, had left his band suit in Liverpool. Panic! Hasty phone calls and much pleading failed to stir the GPO into tracing the suit which had been expressed but, oh dear, wrongly addressed. Unfortunately we had to do the Birmingham show without it. Still, Mike looked nice in his shirt tails and underwear. He was a sensation! On Tuesday 22nd. We were lounging about in Bournemouth when a distress call was picked up. This entailed a headlong dash up to Swindon to back Mike Berry who was having ‘group troubles’. A strange sight was seen at Aylesbury a few days later when the Shades nearly ran down people who were queuing up in the street. We found out afterwards that there had been a power cut and these people were waiting for bread. No harm was done however and Jan 31st. found us speeding towards Doncaster. It may be a coincidence but whenever the Shades visit Doncaster the weather takes a very big turn for the worse and the fog, snow and ice are but a few of the hazards to be braved. On this occasion however we were very pleased to make lots of new friends, especially in the Sheffield area. One consolation for the cold weather was as always the warm and generous hospitality of our now old friends, Mr. and Mrs. Walker of the ‘Moorends Hotel’ in Thorne, nr. Doncaster. Packing our bags on Tuesday, Feb 5th. ‘we set sail’ for Southampton. After the show we found that some kind and generous person had let our tyres down, which should deter a return to the area concerned until we can at least afford an armed guard. It took two hours to get going again and no sooner were we on the road than we ran into a blinding snowstorm. We had originally planned to drive to Bath and then everybody, excepting Noel and Dave, would have been able top return to their homes. This was not to be however and a very surprised mother of Mike Wayne (who shall still remain brainless after the suit episode), found six Shades and one manager draped all over her dining room when she awoke the following morning. The next day was even better because when we arrived in London we found we were locked out and spent the early hours of the morning touring the ‘embankment’. We were all looking forward to the show on the 9th Feb as it was a new place, Ramsey to be precise. Once again we made a lot of new friends. Folkestone also brought forth some more and altogether we really enjoyed our stay there. Tuesday 19th. Feb. found us appearing with Mike Berry once again. On Wednesday we had a laugh when ‘Drive’ and Pete fell off the revolving stage at Stevenage. It took the rest of us 2 hours to stop laughing. A great time was had by all on the Friday at a college dance. We only had to travel a couple of miles for this show but just in case we left a couple of hours early, that is 5 o’clock, the navigation being in the capable hands of ‘Drive’. Comes 7 o’clock and we are still looking, ‘Drive’ having been completely beaten to death by this time – a most definite improvement we all agreed. However, we finally made it and as mentioned we had a great time. Herne Bay, another new place for us, was our next port of call and although I’m afraid we got lost again, we were not late. A catastrophe on Sunday when Mike was taken ill with foul pest or gastro enteritis, we never found out which, and poor old Johnny Cannon had to do the show on his own. We would like to apologize to all our friends at Maidstone but this was unavoidable and the first time it had happened to us. Mike recovered in time for a show at St. Albans on March 2nd. and a good job because once again it was a new place and new friends were very forthcoming. Well we have decided to end the first newsletter here as the length of time to be covered is quite considerable. In the next letter we shall endeavour to catch up on the period from March to date. Hoping to see you all soon, bye’ for now. JOHNNY, MIKE, NOEL, PETE, DAVE, DRIVE AND JACK. Copyright 2004 Noel Lawrence. All rights reserved. The line up has a very long and interesting history. Mike had been singing with “The Pacific Five” for approximately two years when he found that the greatest rival group in Bath was a group called “The Dominoes” of which Johnny was the drummer. Later when Johnny took up singing, the rivalry became even more intense. Mike left his group early in 1958 with the intentions of packing up singing but was asked by Johnny, who was now singing with a rock and roll combo, if he would like to join him. Mike agreed and this was when they first came together which was late 1958. But at this time they had not thought seriously about singing as a duet team. In 1959, Johnny & Mike’s backing group broke up and reformed under the name of “The Shades” featuring Dave Sumner as lead guitarist and John Ransom as rhythm. In 1961, Noel Burns joined “The Shades” as bass guitarist and in 1962 Pete Rowney replaced Johnny Birmingham (who didn’t want to turn pro) as drummer. 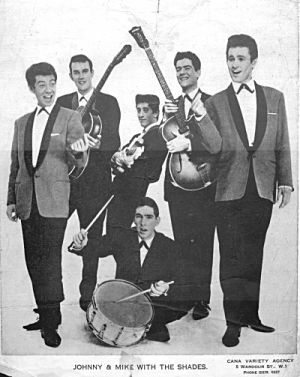 The band played under the name “Johnny Cannon, Mike Wayne with The Shades” and was so popular in the west country and south coast of England that they turned professional in October 1962 and soon after moved to London under the guidance of Jack Fallon of the CANA Variety Agency on Wardour Street, in Soho. The band was highly thought of and actually booked by the BBC to perform on radio’s Saturday Club and several TV shows. This was very unusual in those days as this meant the band performed live on TV because this was prior to video taping and usually bands had to mime to their records. Various permutations of the bands name was used by promoters and venues that eventually, tired of correcting them, settled on Brian Matthew’s introduction (of BBC Saturday Club fame) version “Johnny, Mike and The Shades”. Several recording labels tried to sign up the band but Jack Fallon wanted them to become musically proficient first and able to make a life long career of music. Sadly, while the thought was admirable, the boat was missed. The band was signed by Jack Fallon to a record contract with Decca (still smarting from their failure over the Beatles) following their first Saturday Club appearance. This proved to be a very bad choice and contract. Decca spent a lot of money producing a recording of “Poison Ivy” on the “A” side with “Green Back Dollar” on the flip. Many famous artists played on this recording as session musicians, including Ronnie Ross, sax, and Jim Sullivan, guitar. The Shades did not play but provided vocal backing for Johnny and Mike. Told to go home and wait to become famous the band waited. The rest is history. It later transpired that someone in a senior position at Decca didn’t like the recording and it was canned. The band developed musically under Fallon’s tutorage and had an extremely wide range of tastes, from instrumentals to classic ballads such as “You’ll Never Walk Alone” and “The Wedding”. The inspiration for Gerry and the Pacemakers hit version of “You’ll Never Walk Alone” came from them listening to Johnny sing it at a gig in Widnes. Both John Lennon and Paul McCartney were early fans and their manager, Brian Epstein, tried to purchase the band from Jack Fallon who unfortunately wouldn’t sell. Following firstly John Ransom’s (replaced by Phil) and then Noel’s departure in 1965 the band changed it’s name to the “Cannon Brothers with The Shades”, released a single “Turn your eyes to me” on the BRIT label (BRIT WI-1003 and available on the “Some Like it Hotter” web site). On the 25th. April, 1965 the number entered the Radio London Fab 40 at #36 but promptly disappeared the following week. The band toured with many big stars such as Roy Orbison, The Everly’s and the Rolling Stones before breaking up some time in 1967. Additional thanks must go to Harry Stockwell and his wife who formed the Shades Fan Club in 1963.